this was pretty much the only idea i had for the contest. 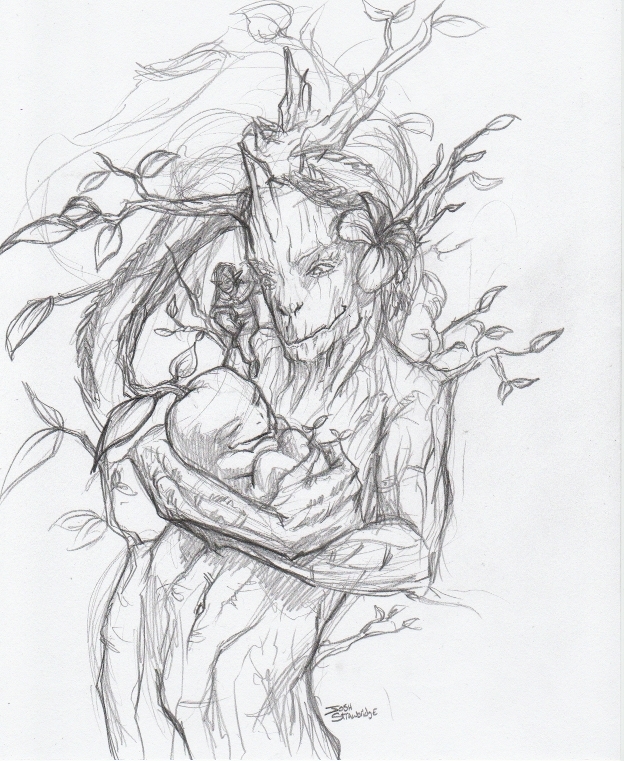 a treant with a newborn. the way i imagine it the treants out live even the longest lived of elves. 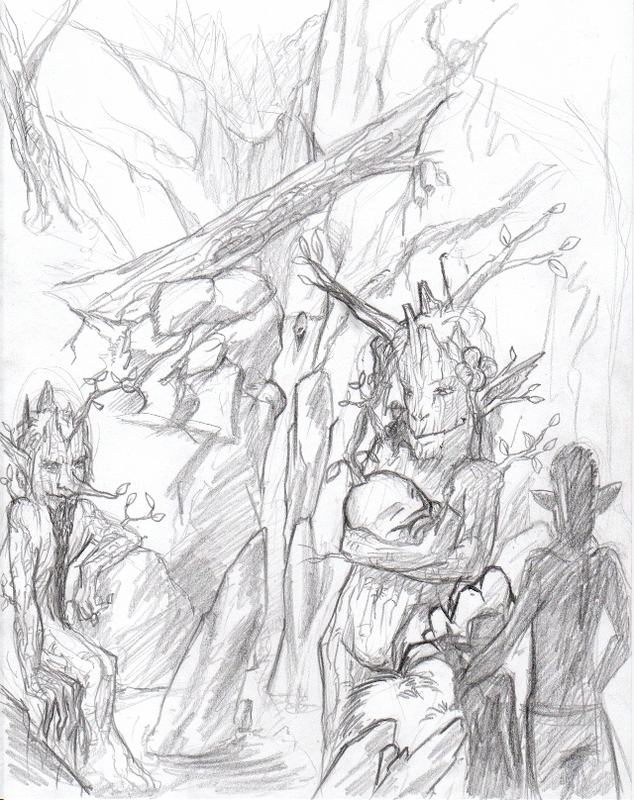 however, newborn treants are rare even for elves to see or the world would be practically overrun by treants. first sketch of the main subject of my contest entry. sorry for having no sort of background yet. i really need to get a move on even though i'm sure i've got hardly a chance. i like your sketch! i also kind of like how the little baby one looks like its an apple. Heh. How do you feel about not having the little figure on the shoulder--or adding more little figures? well, i did plan on adding more of them but i never thought about leaving them out. now that you've mentioned it i do think the sketch would look better without the elf there. i'm a bit attached to the idea of elves coming to see the baby though so at least for now i think i'm going to add more and see how that goes. thanks for bothering to check it out. i think it will work with OR without the figures, he just seems out of place at the moment..but it might just be that where he is at weights your image too much to the left because there's nothing on the bottom right to draw the eye back.Once you work more on it, it'll be fine. I really like the line work and it is really nice to look at all the little details. It looks liek it is coming along great..the only thing I would say is that the area on the right is very white without anything from the fourground image. Maybe try to have some more branches coming off his back into that area. At the moment it makes it look a little like the figure is being pushed to the other side on the paper. It has to do with the postive and negative space. thanks ladies and/or gents. these are just planning and idea sketches so far. i am a little slow at working things to a finish so i hope i'll actually be able to finish this before the deadline. there are a few changes i want to make to this. making her a bit bigger and giving her back some of the curve she had in the first sketch, shrinking the elves and the bit of land shown in the foreground, and pushing the background a bit farther back. i think for the most part the image is going to end up being brown, green, and gray. lots of plants and rocks after all. the baby will of course be red. other than that i'm pretty much just figuring it out as i go along. i hope this fixed some of the problems you all left from the first image and gave you whole new ones to point out .